It seems like progress has been slow lately, but if you just keep plugging along, eventually stuff gets accomplished. I thoroughly enjoyed my quick trip to Santa Cruz for Maria Shell‘s workshop! 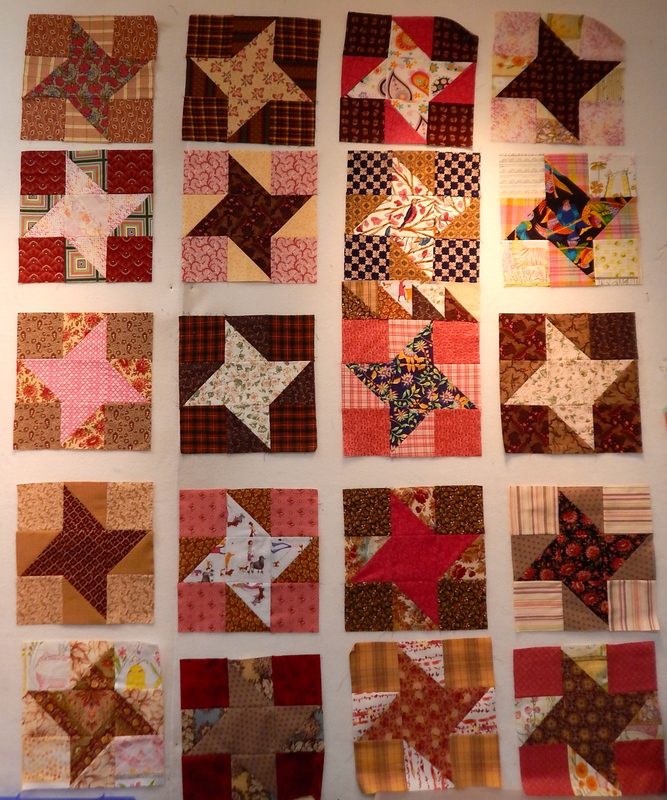 I stopped at the San Jose Museum of Quilts and Textiles, and they had a brand new exhibit up–what a treat! 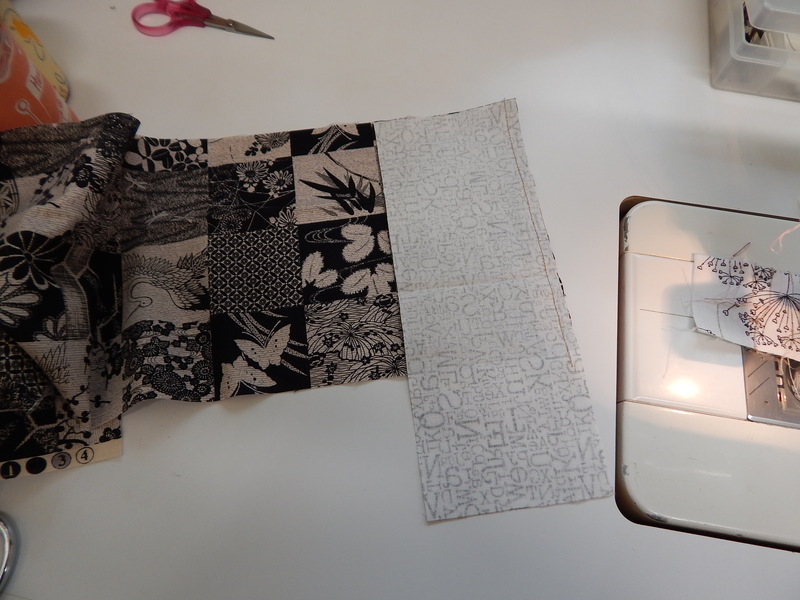 Maria’s workshop was great, and she had lots of ideas for us to try using solid fabrics to make prints. So I used them to make these curved pieces. When I started working on them, I wasn’t quite so charmed with their colors. So I put them up on my design wall when I got home, and I am pondering the possibilities. Even if I don’t use these particular pieces, I love the technique that she taught, and I know I will use it again soon. 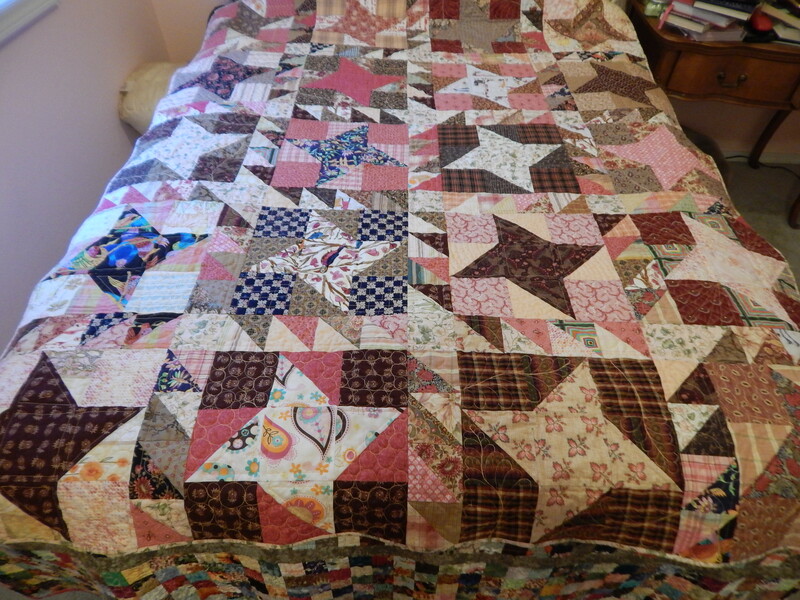 My gardener was due for a visit, and so the pressure was on to finish the quilt for his first granddaughter. Do any of you have “issues” with charging for your work? I don’t ever want to do anything for free, but on the other hand, I would not pay what I charge for a baby quilt–I want to say “go to Marshall’s, you can get a great baby quilt there for a fraction of the cost.” Nonetheless, we traded work hours for the quilt. MLG has done a miracle in my yard–worth so much more than a quilt. 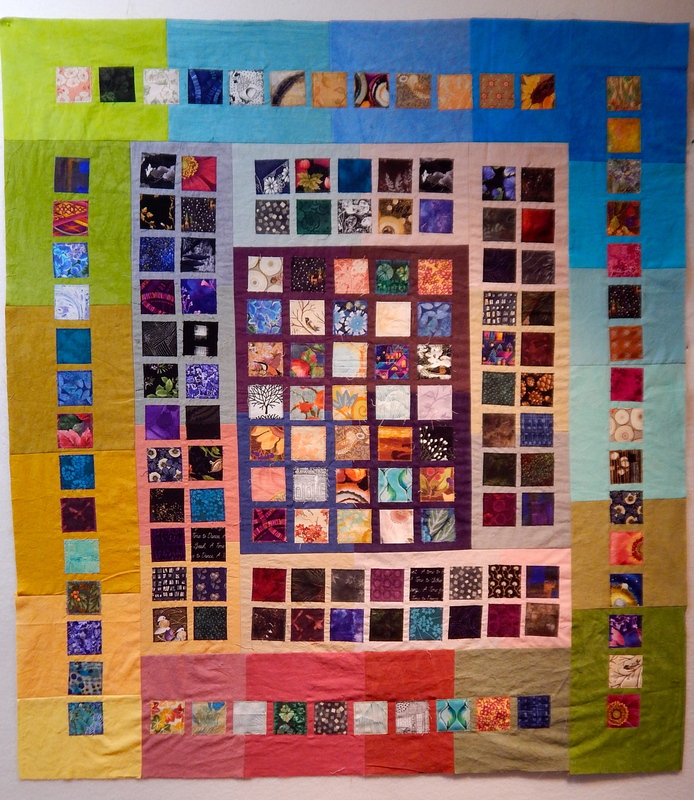 Here is the finished quilt–I just quilted simply around the birds, put some radiating lines around the “frames,” and did simple wavy lines in the sashing. I ended up following the fabric pattern to quilt the border. 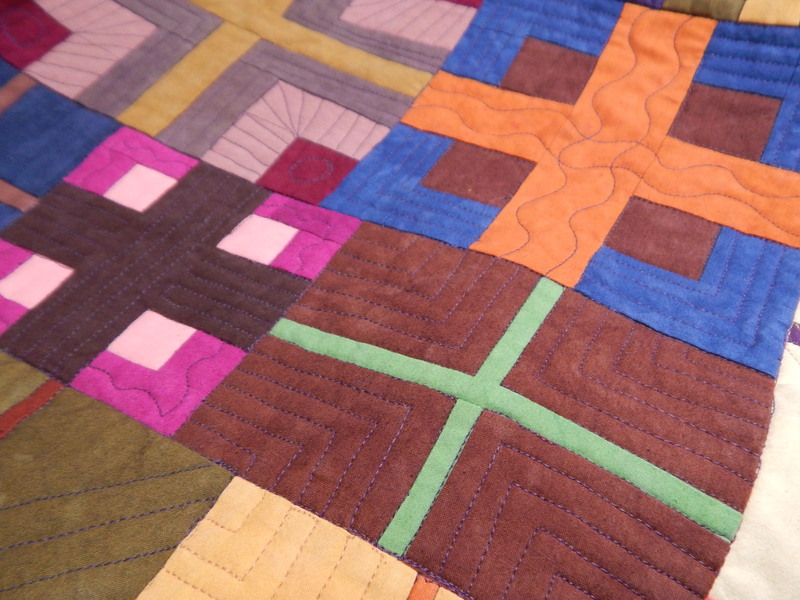 I wanted it to be sturdy, but not too densely quilted for a quilt that I hope is used and loved for a long time. I had the idea to cut out one of the bird prints, and use that space for the baby name and info. I was really pleased with how this came out. 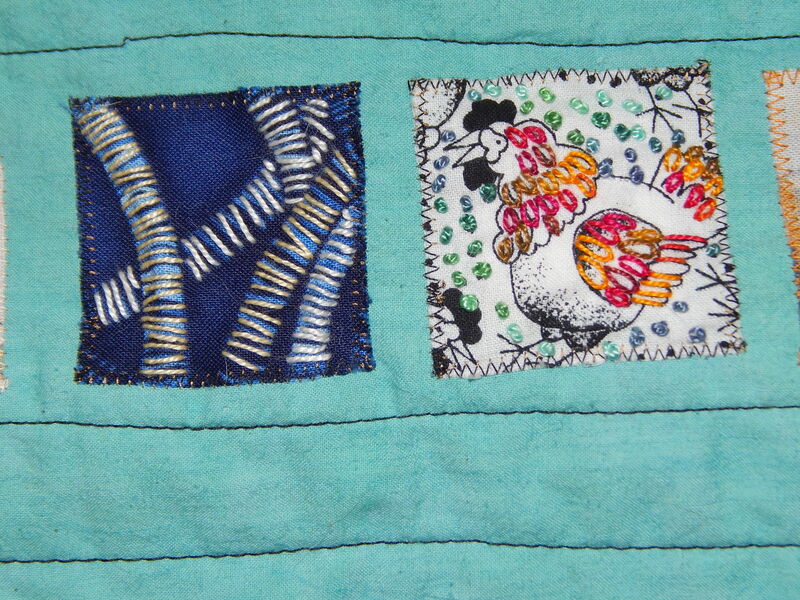 In the meantime, mostly in the evenings, I kept plugging along at the little squares that I was embroidering. Last night I finished the 153rd square! 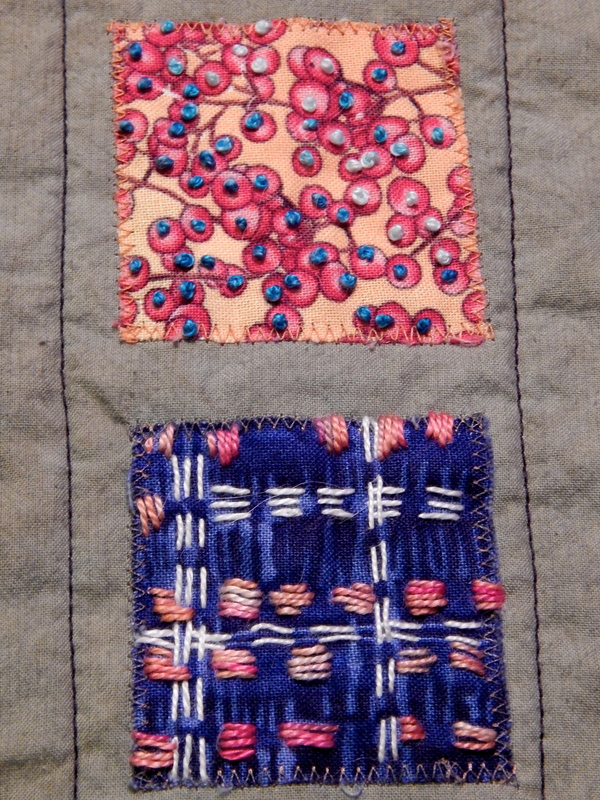 Now I am going to quilt it, and add a backing fabric onto it. I had a muslin back on it, just for stability, but now for the first time I am going to try my idea of adding a second back so that the embroidery thread work won’t show on the back. 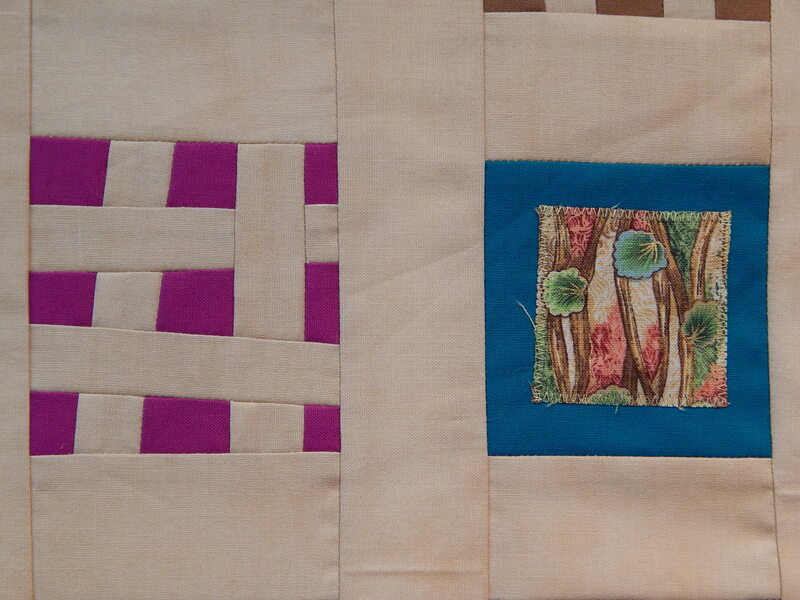 I am only going to show you a few of the squares that I finished. You’ll have to wait until its finished to see the whole thing. And now on to the studio! In case any of you reading this blog do not read my other blog or follow me on Facebook, my nice calm life was interrupted a week ago by the Butte Fire! It was fairly close to my home, but then the wind took it in a different direction. Me and the doggies evacuated for a few days. But now the fire is under control, and all is returning to normal, at least in my little life. 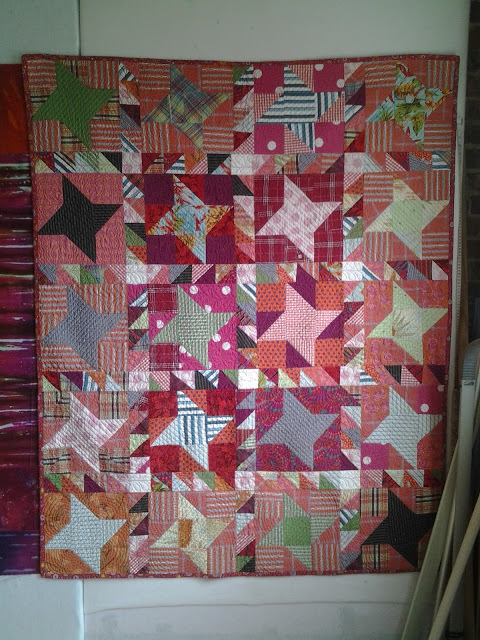 I don’t think I ever showed you the finished quilt P.I.N.K. I do love it, and will use it as my favorite lap quilt this winter. 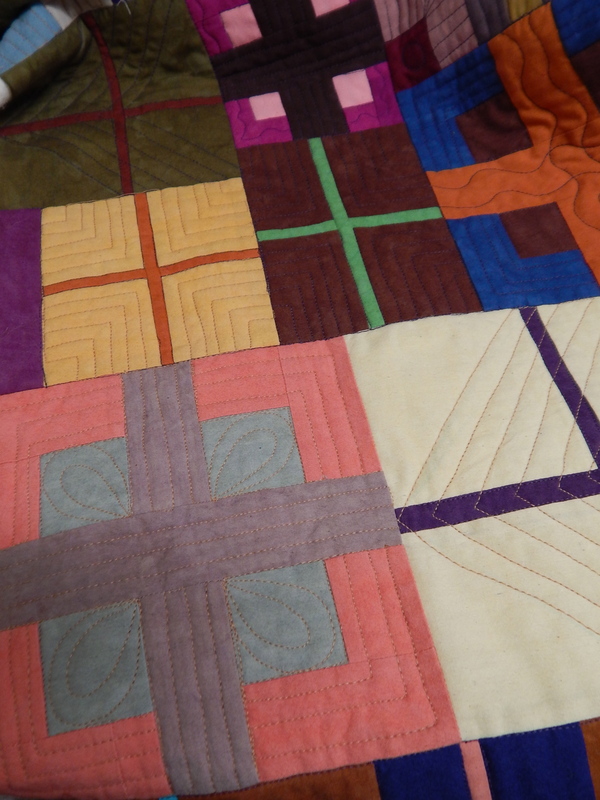 I quilted each block a bit differently. That probably kept me going on it. 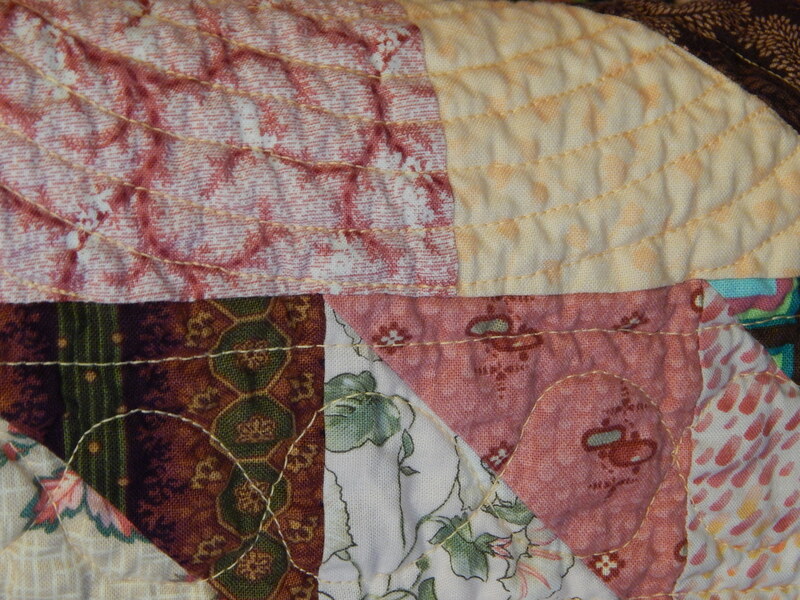 I love how a quilt crinkles after you wash it! Last week, B.F. (before fire) I was determined to get back to my rug. I finished the hummingbird and these trumpet flowers. And that’s as far as I got. 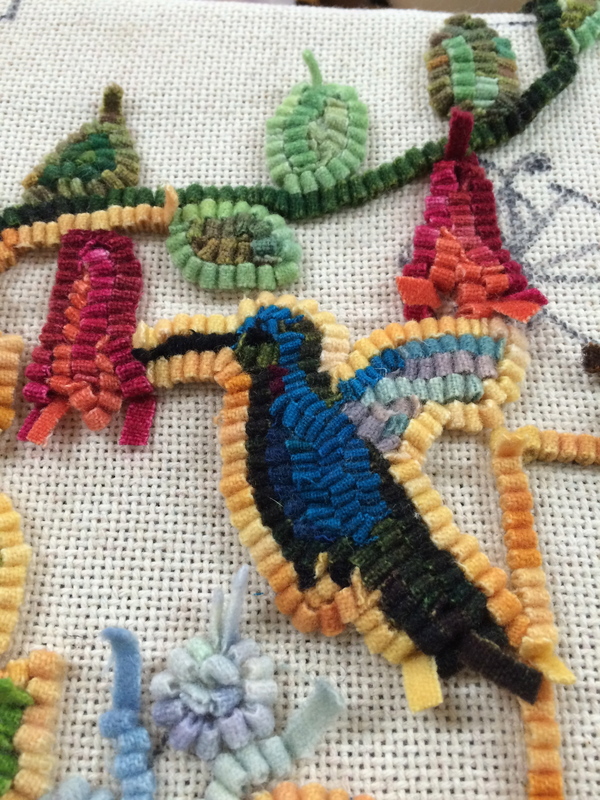 Hopefully, more rug hooking will be on slate for Monday. To get back into the studio, I did a little fun, no-meaning playing around. 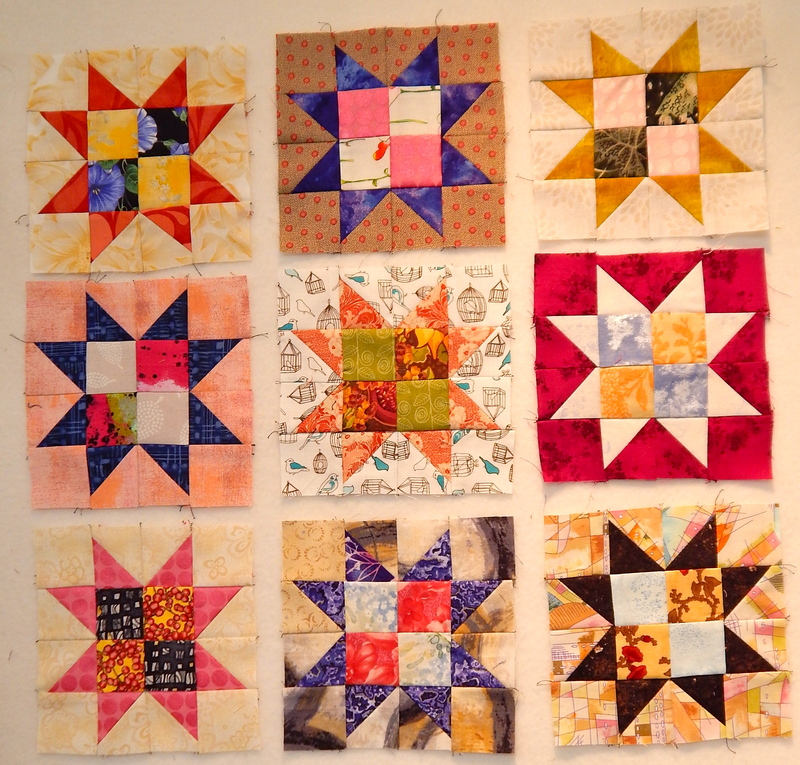 These star blocks are all done with my box of little two inch squares. Very fun to first piece some four patches, and then to choose two more colors to make these stars. 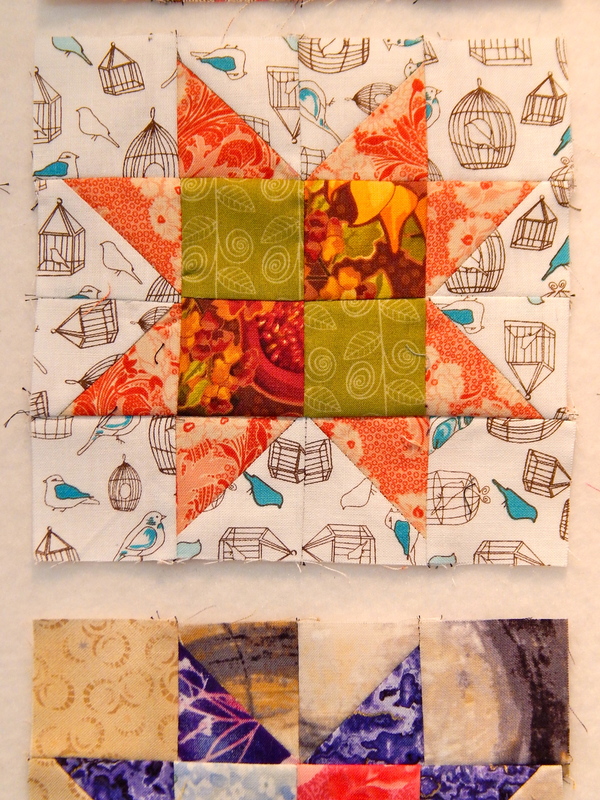 I actually like this method of making the star points (or flying goose blocks.) There is a seam in the middle, but it seems to be a very accurate way of making those blocks. 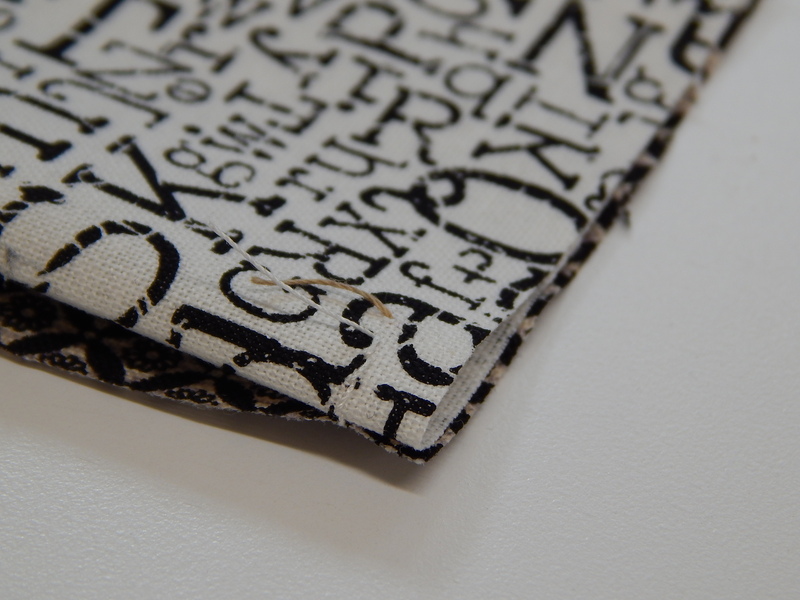 I just take the two inch squares, and draw a line right down the middle diagonal and then stitch on the line. B.F. 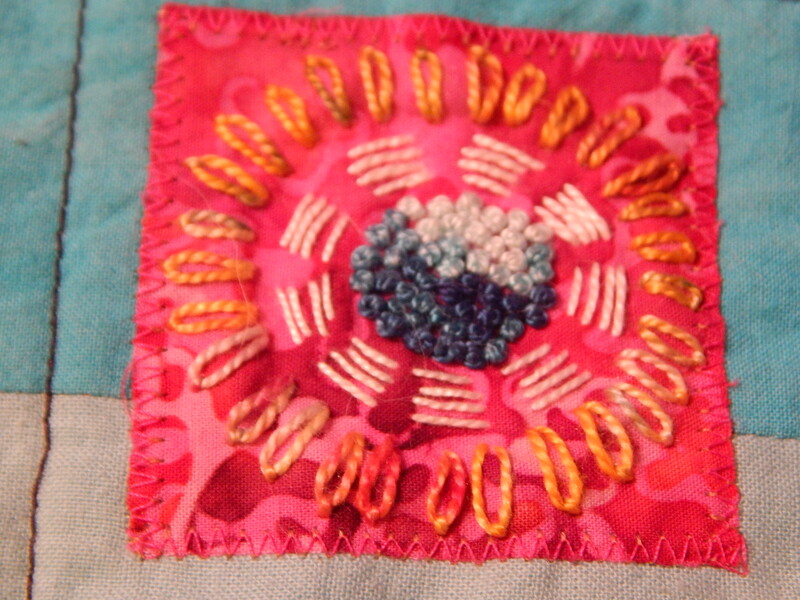 I had started hand stitching on this piece. 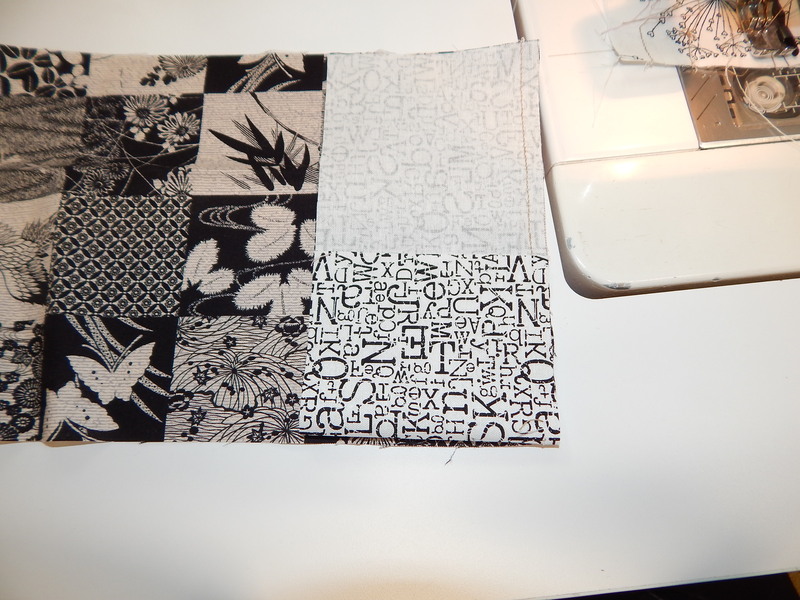 There are 150 two inch squares, so lots of places to do a little doodling. This was the hand project that I grabbed to take with me when we evacuated. In church last Sunday (in the midst of the Butte Fire) we had such a special service. There were several couples there that had lost their homes to the fire. 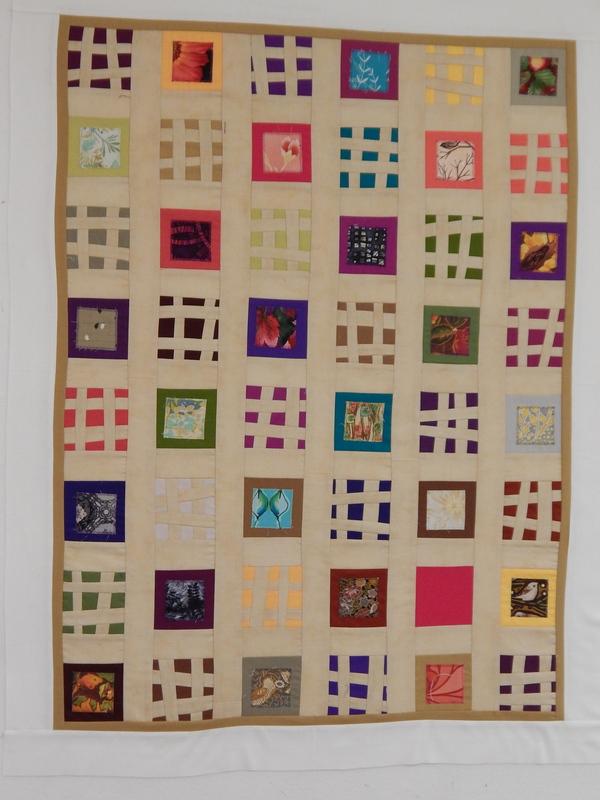 I did have a little inspiration for a quilt about the fire, and I am working on that this week. I will share that with you next time. In the meantime, be safe and be thankful! Posted in little squares, stars! 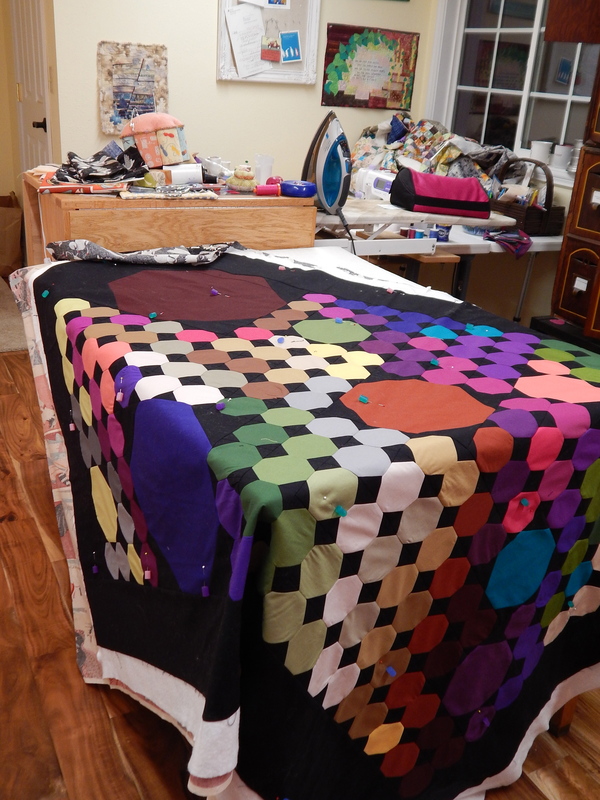 A few posts back, I showed you the pile of 3″ squares and the snowball quilt I was working on. Here’s the finished snowball quilt. 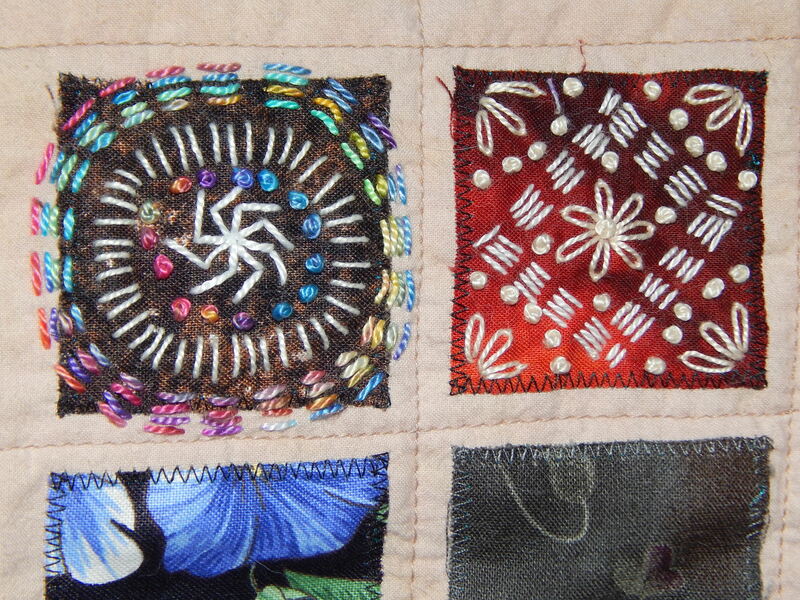 I put a simple wide black border on it, influenced by the great Amish quilts I saw at the San Jose Museum of Quilts and Textiles. By the way, if you are ever in the area, I can’t recommend this museum highly enough. 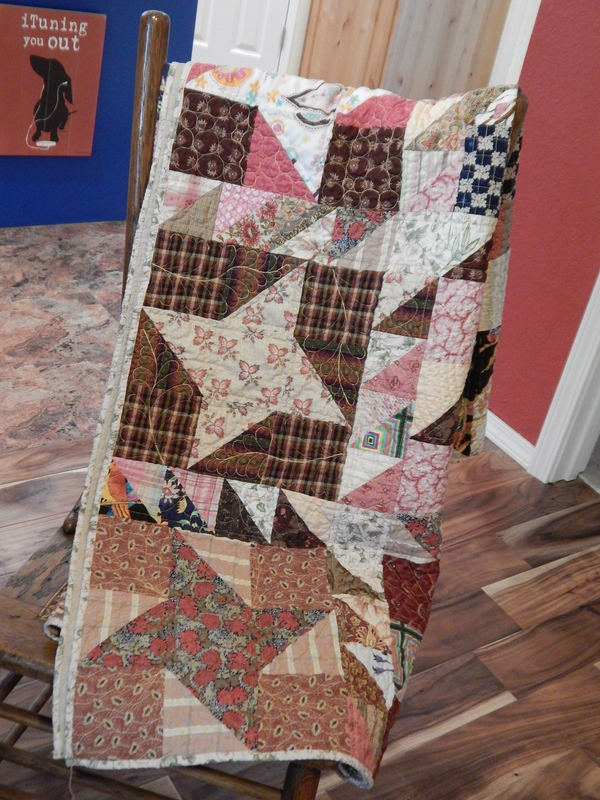 They have great exhibits, and it is so lovely to see quilts displayed in such a beautiful way. Well, it seems my figuring was a bit off, because I finished that snowball quilt top, and still had a huge pile of 3″ squares. When auditioning backgrounds for the snowball quilt, I came across a piece of dyed golden beige fabric. It was really pretty with the jewel tones of the squares, so I put it aside, thinking that I might experiment with it after the snowball top was done. I only had 1/2 yard of the golden beige fabric, so this one was smaller. I had fun making these squares–you can see here, I simply zigzagged one of my many 2″ squares in the middle of the 3″ square. And the other ones I cross-cut 4X, inserting free-hand cut strips of the background color. Then I had to square up the finished piece to the original size. 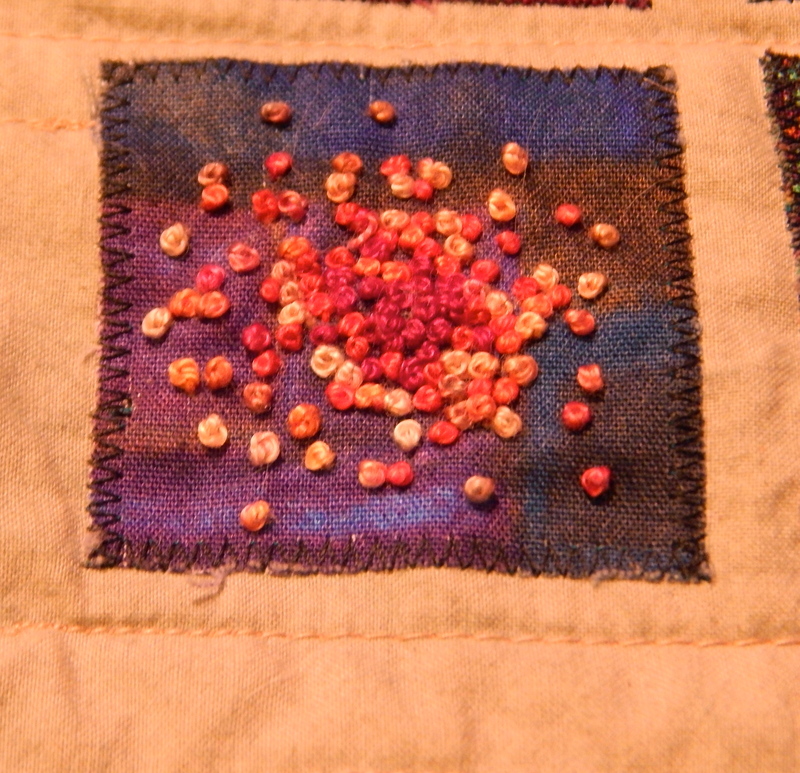 And THEN, I still had a big pile of the 3″ squares leftover. 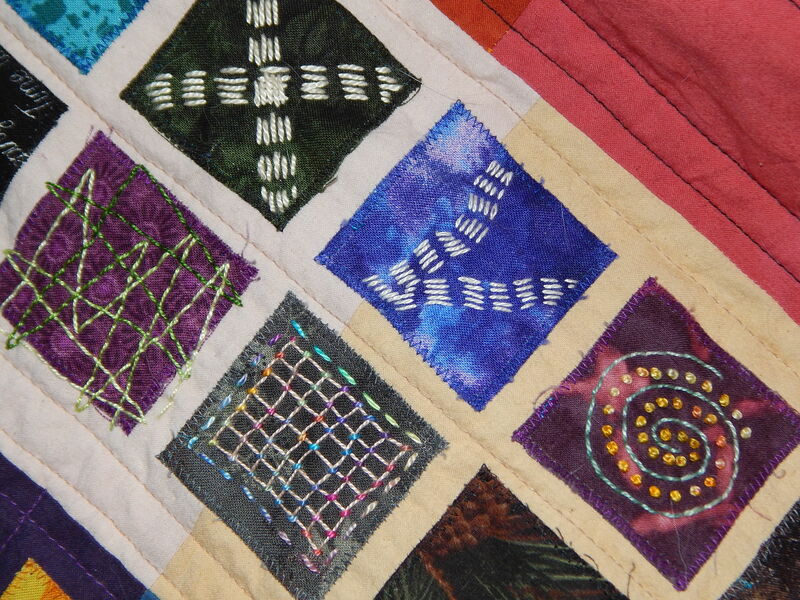 And I think I was looking at some of the modern quilts at QuiltCon (BTW, its going to be in California next year!!!) 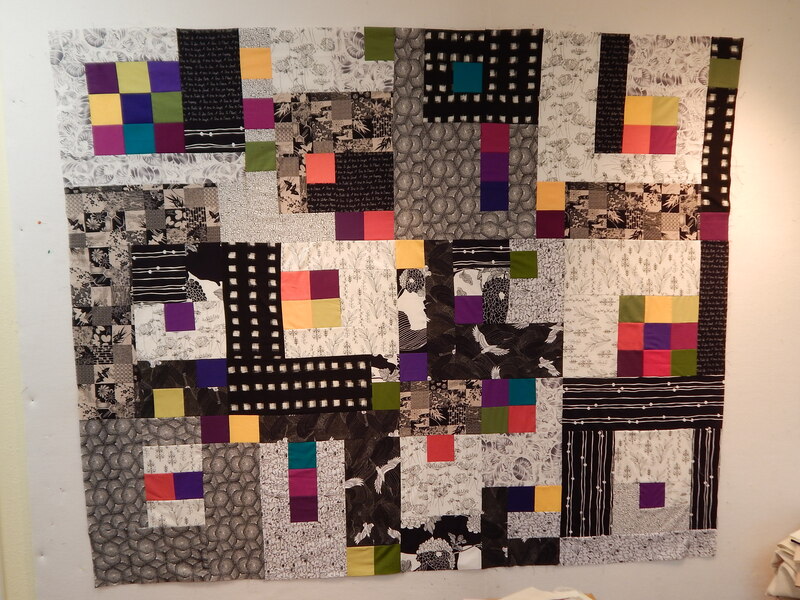 and I saw a black and white quilt, and that gave me the idea to play around with my black and white fabrics. 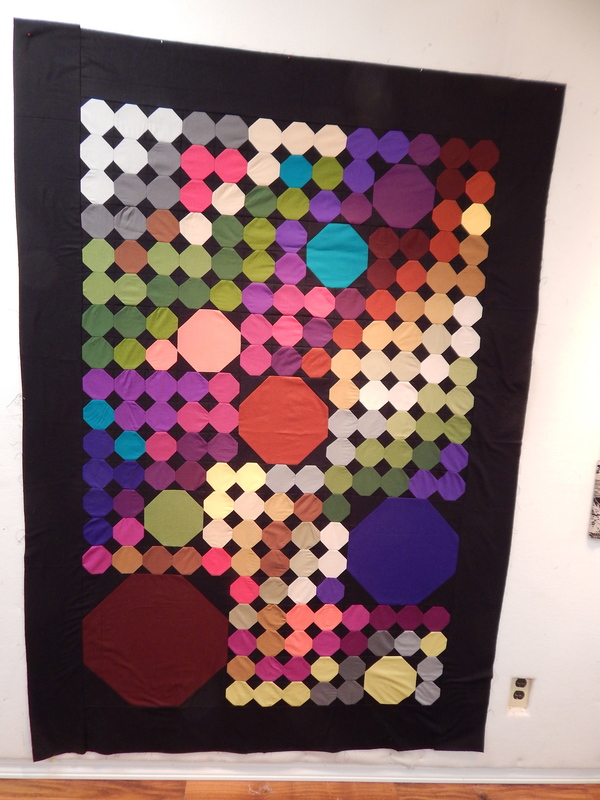 This quilt was quite fun. I simply cut 3 1/2 inch and 6 1/2 inch strips, and improvised as I went along. After I cut those strips with a rotary cutter, I did all the rest of the cutting with my scissors. This method worked out pretty accurately. After I sewed a strip on, I simply carefully folded the strip back on itself, matching the bottom edge of the seam, and making sure the unsewn edge of the strip matched the side of the sewn edge. I held it carefully in place and cut along the fold. My goal this week was to get all three of these made into quilt sandwiches. 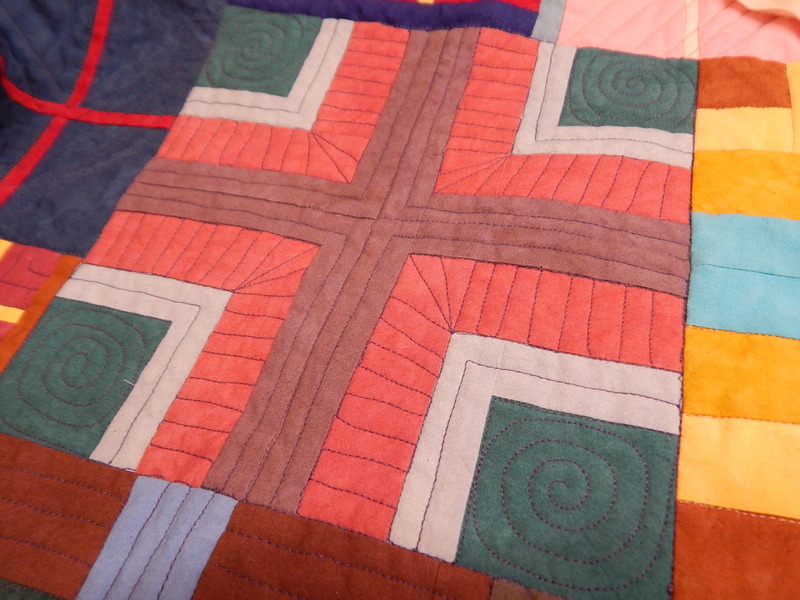 I am hoping by doing this that I won’t continue to add to my pile of unfinished quilt tops. And also, I am ready to move on to some serious projects, so I wanted to clear out the studio.